Take a walk around your neighborhood and we’re sure that you will notice that most of the houses are sporting white colored rain gutters. Being the standard color that it is, white is an obvious choice because it has the ability to match anything. But for those of you who are looking to take your exterior to the next level, Bell Seamless Gutters has much more to offer. With 14 different colors for you to choose from, the next time you think about installing gutters on your New Jersey home, we hope you’ll consider something outside of the box. You can stick to the same color scheme and pick a matching color for your rain gutters or shoot for an accent color and make them stand out – the choice is yours. Changing the color of your gutters is such a small adjustment but it can make such a difference to the look of the house. The best part is that you won’t have to spend a fortune to make it happen! If you’ve thought it over and think it would be best for you to stick with the white, that’s not a problem either. Bell Seamless Gutters offers a hi-gloss white as one of its 14 color options, so you don’t have to sacrifice the great expert service just because you’re not a color person. 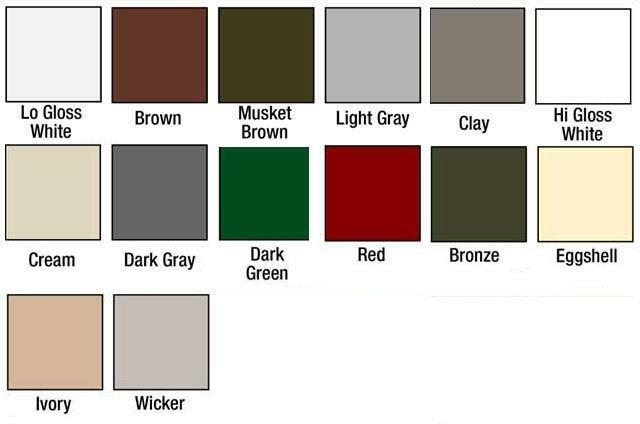 Take a look at the color choices we have below and give us a call the next time you think about installing gutters on your home!